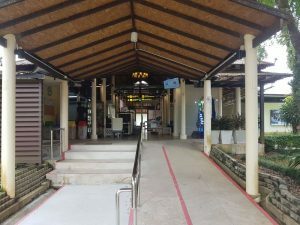 Trat Airport, ( IATA code TDX ) is the airport used by visitors who prefer to fly to Koh Chang, Koh Kood or Koh Mak rather than travel by road from Bangkok. 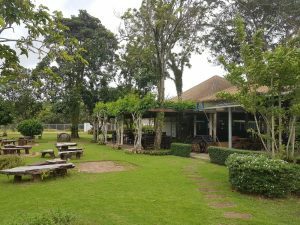 It is located in Trat province and is approximately 17Km from Ao Thammachat (for ferries to Koh Chang ); 22Km from Centerpoint pier (for ferries to Koh Chang); 25km from Krom Luang pier (for speedboats to Koh Mak) and 60Km from Laem Sok – where the passenger boats to Koh Kood depart. 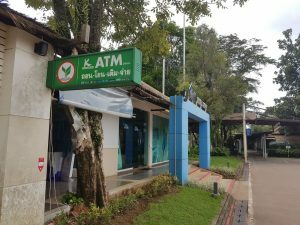 The town of Trat itself is around 30 minutes drive away, although very few people stay in the town. Most passengers are on their way to one of the outlying islands. 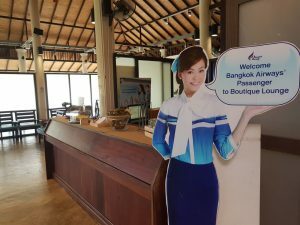 The airport itself is one of the smallest in Thailand and, in keeping with Bangkok Airways’ two other private airports at Samui and Sukhothai, it features a tropical, open plan design and a very laid back, informal atmosphere. With just four arrivals and departures per day, it’s also possibly the quietest airport in Thailand. There are a few basic facilities at the airport – a car park, small cafe, ATM, transfer desk and toilets. 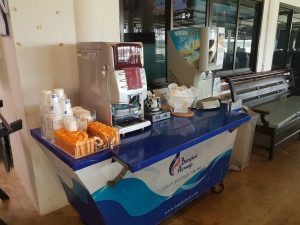 Free snacks and drinks are provided for passengers waiting for their flight to Bangkok. Free wifi is also available in the departure area. Trat Airport is privately owned by Bangkok Airways. This airline is a regular winner of awards for being one of the best small airlines in South East Asia. They fly to many domestic and international locations from their base at Suvaranbhumi Airport. They operate four flights per day to Trat by 70 seater, turbo-prob ATR 72 planes. These twin engine Franco-Italian planes are used in over 60 countries and are ideal for short haul flights. 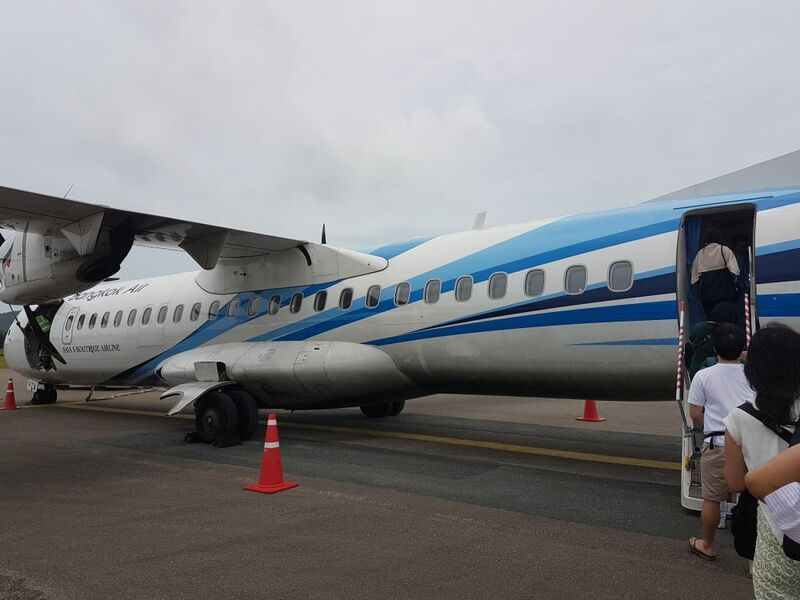 Flying time between Bangkok and Trat is timetabled as being an hour, but in reality it is closer to a 40 minute ‘sky hop’. Note that during the low season ( June to October ) one of the daily flights in each direction may we;ll be cancelled. Usually this is PG301/PG302. 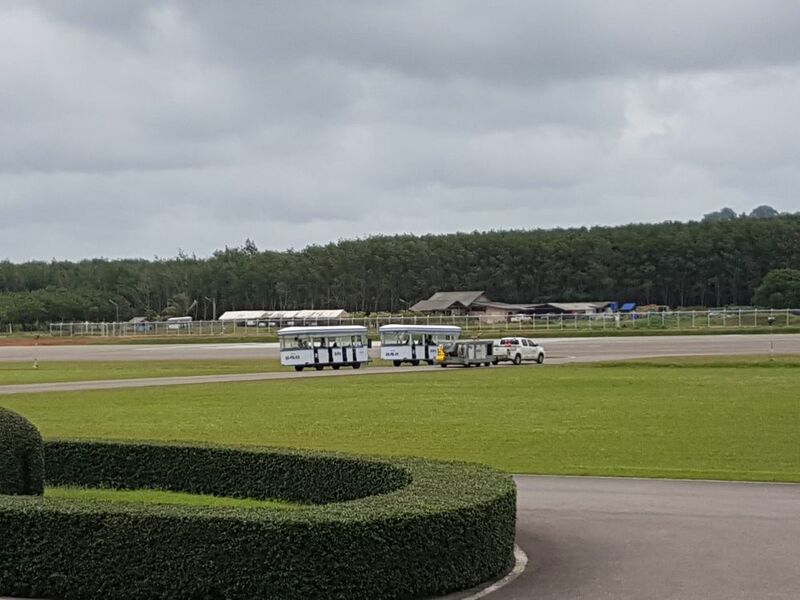 You can check the status of recent flights here: Trat Airport Flight Status It shows flight departure and arrival times for the past few days as well as real time information for today’s flights. * Two new flights, PG309 and PG310 have been added from 1 November 2018 onwards. These will probably be subject to demand, so passengers may well be bumped to a later flight if occupancy is very low. During the Low Season there are often some good deals to be had on flights, with one way prices as low as 1,200 Baht inclusive of tax. However, during High Season, it’s hard to find tickets for under 2,800 Baht one way. And during Peak Season prices rise to over 3,500 Baht. Look for the ‘Web Promotion’ prices. These are the cheapest tickets but are non-refundable. 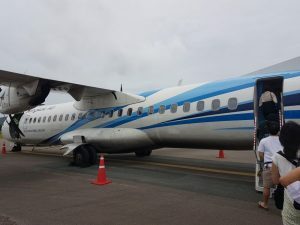 All flights to or from Trat go to Suvarnabhumi Airport in Bangkok, this makes it easy to connect to either international flights or domestic flights on Thai Airways or Bangkok Airways. Note that budget carriers now all use Don Meaung Airport and not Suvarnabhumi. Since 2015 it has been possible to clear Customs and Immigration at Trat Airport. 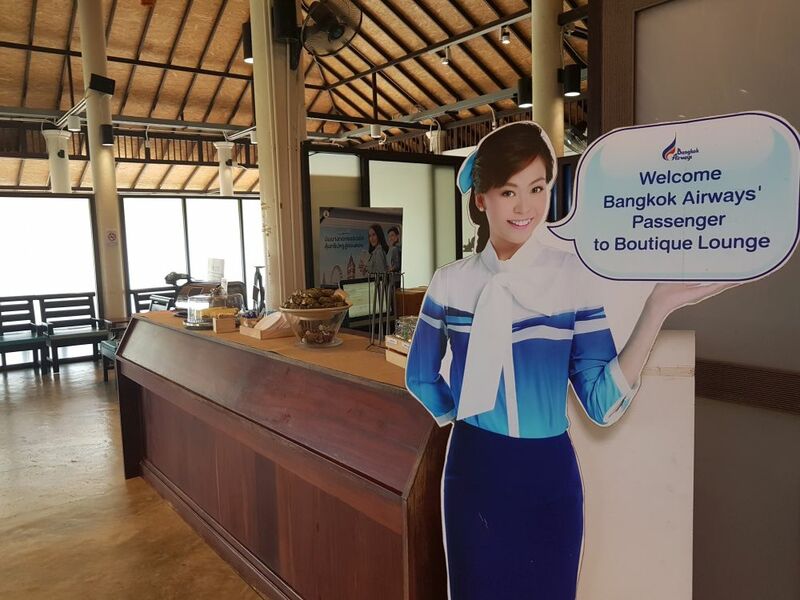 The main benefit of this is that is allows passengers on either Bangkok Airways or their partner airlines to check in baggage through to their final destination and also clear Immigration when arriving or departing Trat. 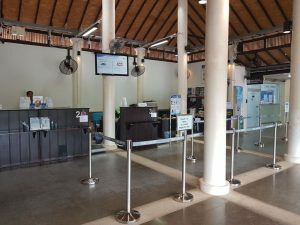 More details of the through check-in process, including luggage, boarding pass restrictions and partner airlines can be found here. 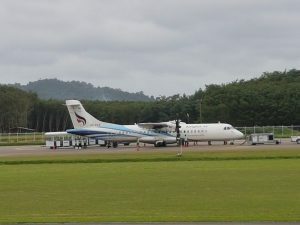 Trat is a very small airport and so has limited transport options. 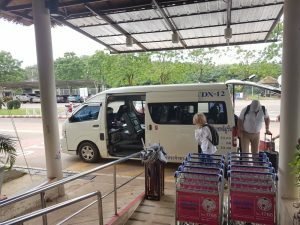 However there is a shared minibus service from the airport to hotels on Koh Chang and also to Krom Luang pier (for boats to Koh Mak) and Laem Sok pier for boats to Koh Kood. These are run by Krungthep Limousine. 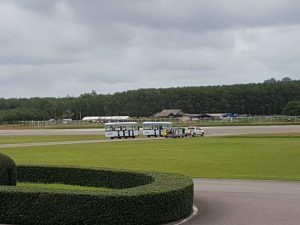 There are no public taxis or buses pick up passengers at the airport. But private transfers can be easily arranged on this site. The vehicle ferries from the mainland to Koh Chang run from early morning until 19:00. Ferries run daily throughout the year and it is extremely rare for a sailing to be cancelled. 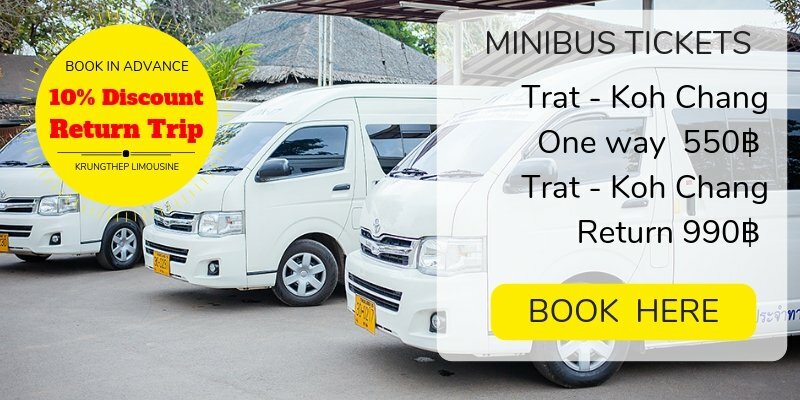 There are both shared minibus services and private transfers from Trat Airport to hotels on Koh Chang. There aren’t any local taxis or bus services. 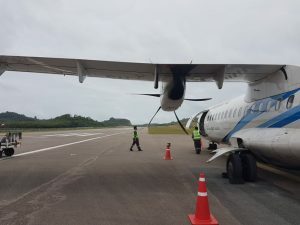 Passengers can either arrange transport when they land in Trat; arrange it in advance online or through a local agent or ask their hotel to send a driver to meet them. The shared minibus is the most economical option. This drops passengers off at all hotels and resorts on the west coast of the island. However, it doesn’t go along the sparsely populated east coast. 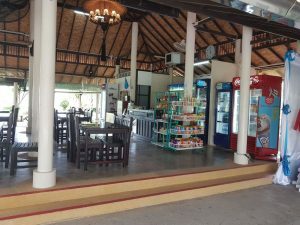 If you are staying on the east of the island anywhere to the south of Amber Sands or Serenity Resort then you will have to arrange for your hotel to pick you up from the ferry pier. Or, take a private transfer. Driving time from the airport to the mainland pier is around 20 minutes. Then you have a 30 minute ferry crossing. Ferries depart every 45 minute or more frequently if it is busy. 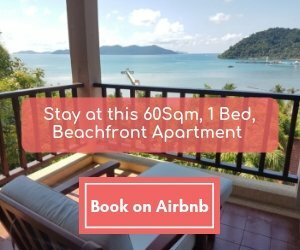 Once on Koh Chang it’s anywhere from 15 minutes to an hour drive, depending on which beach you are staying on. Ticket prices are 550 Baht one way. You can reserve them in advance or can buy at the airport when you land in Trat. You will save money by booking a return trip in advance. Private transfers can also be arranged at the airport, although it will save a significant amount of money by booking in advance. Figure on 1,900 – 2,100 Baht for a car and driver for two passengers to a resort on Koh Chang. Or from 2,400 – 3,100 Baht for a minivan for up to 7 passengers. 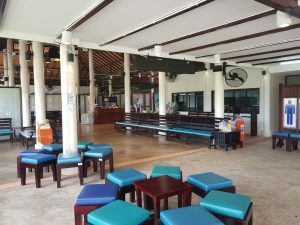 If you are staying on the east coast then you’ll either have to book a private transfer, or take the shared minibus and get dropped off at the pier on Koh Chang. Then arrange with your hotel for them to send a driver to pick you up. There are speedboats at regular intervals from Krom Luang pier, near the village of Laem Ngop to Koh Mak. The first speedboat of the day is at 10:30, so there’s no problem for passengers on PG301 to connect with this boat or one at 11:30 or 12:30. Passengers on the lunchtime flight, PG305, can take a speedboat to Koh Mak at 14:00, 15:00 or 16:00. However, anyone taking the evening flight will have to wait until the following morning to get to Koh Mak. The shared minibus service will drop passengers off at the pier. Ticket price is 500 Baht. A private transfer by car can easily be pre-booked for 1,500 Baht. Or from 2,300 – 2,600 Baht for a minibus which can seat a maximum of 8 passengers. Trat immigration office is also located in Laem Ngop within easy reach of the pier. Anyone needing to extend their Tourist Visa can do so here. If you plan on getting to Koh Kood the same day then you’ll need to be on flight PG301 or PG305. 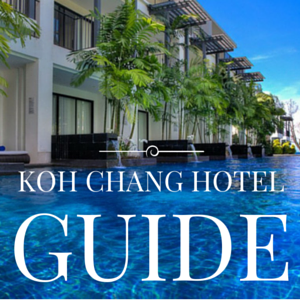 From the airport you’ll need to tak the shared minibus or arrange a private transfer to Laem Sok pier. 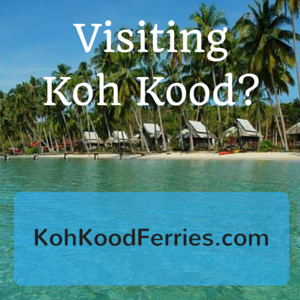 If your flight is on time, which they usually are, then you’ll be able to catch the 10:45 Boonsiri Ferry to Koh Kood. Or failing that, the Koh Kood Express or Koh Kood Princess at 12:00 – 12:30. Unless you are travelling over New Year or Thai New Year, there is no need to buy tickets in advance. However, these can be booked online via the boat company websites. 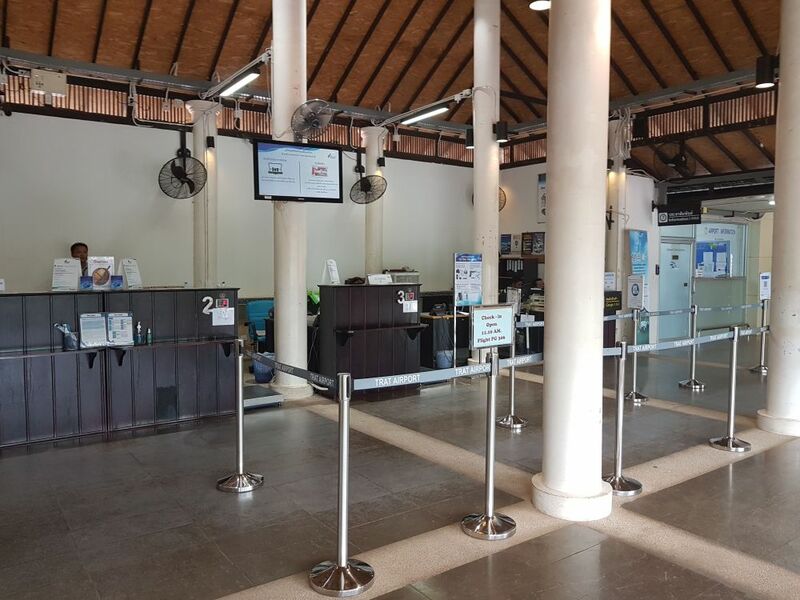 The service also runs twice daily from Laem Sok pier to Trat Airport. This is only suitable for passengers departing on PG308 or PG310 . 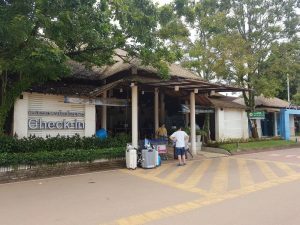 Anyone on PG302 won;t be able to get from koh kood to the airport in time for the flight. And passengers on PG306 will need to take a private transfer in order to get to the airport in time for their flight. Tickets for the shared minibus are 700 Baht per person from the airport to the pier. A private transfer by car from Trat Airport to Laem Sok pier, for two passengers, is 1,500 Baht. Or from 2,300 – 2,600 Baht for a Toyota Commuter minibus which can seat a maximum of 8 passengers. 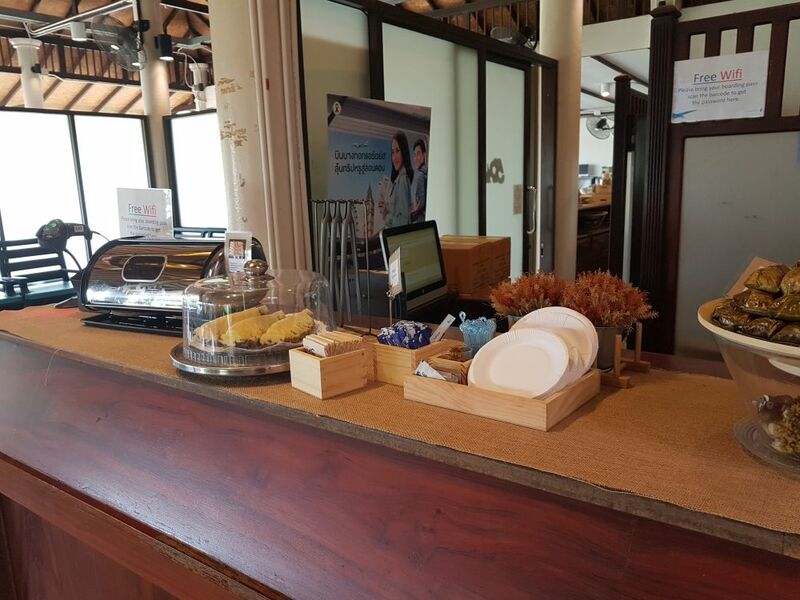 A car hire service is available at the airport, which is ideal for independent travelers visiting Koh Chang. It is an easy drive to the mainland ferry pier and then, once on Koh Chang, the roads are in good condition. Care is needed on some hills and also when driving at night, as there are very few streetlights. Daily (24 Hour) rental rates are from 1,400 Baht for a small automatic car. Great site. Thanks for adding this detailed information. We fly to Trat in early August and plan to hire a car to drive around the island and also see some of the mainland sights. Possibly also head down to the Cambodia border. Do you know who offers the car rental service? Is it a local company or one of the international firms? The car hire service is provided by Krungthep Limousine, who also run the minibus services on behalf of Bangkok Airways. Hi! I will travel to Koh Chang early February. Then I will return to Bangkok by Flight PG302 in the morning at 10 a.m. Just want to ask, if I stay in the hotel at Koh Chang, is it possible to catch the plane? Is there any speed boat or ferry available in the very early morning? Hello, we are planning our trip in April, flight from Bangkok to Trat, and then heading to Koh Kood. May I ask if there is any restaurant close to Trat Airport? Considering that we have a kid and several olders travelling together, it is better to collect the restaurant information in advance. Your earlier feedback will be highly appreciated. Thank. Hi. There’s no restaurant near the airport. There are a couple of places to eat at Laem Sok pier when you are waiting for your boat. 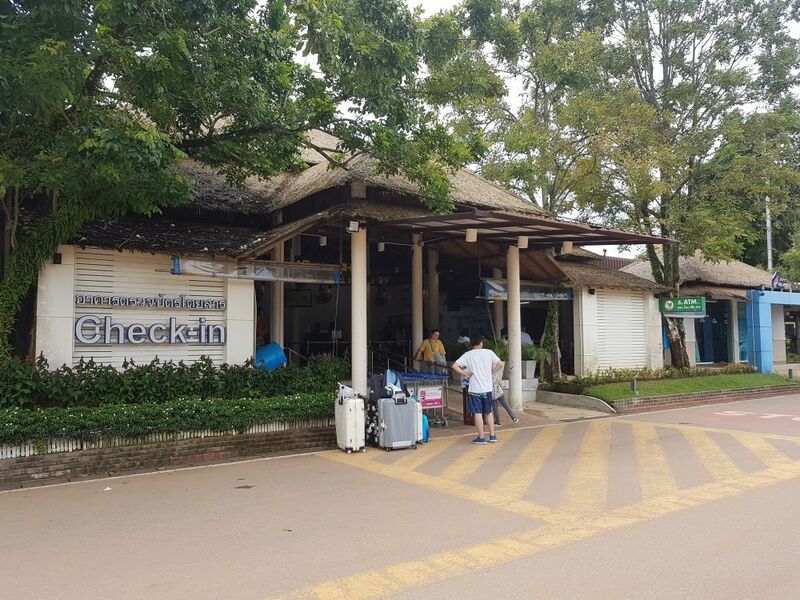 You will need to arrange transport from the airport to Laem Sok pier. You should take the Bangkok Airways minibus. That is the easiest way to get from your hotel to the airport. Or you can try to get a taxi or shared minibus when you arrive at Ao Thammachat pier. Don’t go to Centrepoint pier. We are travelling from Ko Kood via Trat to Bangkok, tomorrow. As the ferry from Ko Kood departs at 12:00 we are going to be at Trat Airport around 14:30 and our flight is at 18:30. So we have plenty of time there. I was wondering if we could do early check in or store a louggage at airport? And then take a transfer to Trat? Is it possible? You could do that. You will need to arrange a driver to take you privately. Contact the Krungthep Limousine office when you arrive at the airport. Arrival at the airport of Trat PG 305 at 12H40. Departure Laem Sok pier for Koh Kut at 14H20 (Boonsiri). Do you think I could take my boat ??? Yes. You will be able to take your boat. 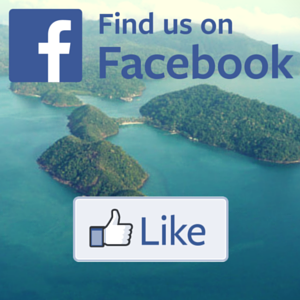 But you need to arrange a taxi to take you to Laem Sok pier – about 45 minutes drive away. on 27.04.2017 we are travelling vom Koh Kood via Trat/ Bangkok to Dubai. Our flight starts at 13:10. Our Speedboat in Koh Kopf starts at 09:30 so we are going to be at Trat Airport at 11:30-11:45. Is there enough time to check in? Hi George. You’ll have no problem catching the flight. But you’ll need to arrange to have a driver waiting for you at the pier when you arrive in order to get to Trat Airport quickly. great informations here. I would like to book the flight Flight PG306 at 13.10 from Trat to Bangkok and I already booked a resort at Koh kood. My question is whether there is enough time taking the ferry from Koh Kood to Laem Sok pier at 9 AM and coming to the airportz of Trat until 13.10 PM? Cause I don’t know how long the trip will take and how early we must arrive at the airport. Second question is which transport to use from Laem Sok pier to Trat airport: Is the best plan to use a free taxi and what will it cost? It is mpost important for me not to miss a taxi or bus and miss ther flilght. What is the most secure option? From Laem Sok pier you should arrange a private transfer to Trat Airport. That would be 1,500 Baht total. There isn’t a shared minibus service. Thanks for the great information you share here. Just bought the flight from Bangkok to Trat PG307 this Saturday. Do we have enough time to make it to the last ferry to Koh Chang 19:00? What is the fastest way and how much is it? I have a flight from Trat to Ko Samui on Nov. 1st at 10am. Will I be able to make a 10am flight in Trat if I leave from Koh Chang in the morning? 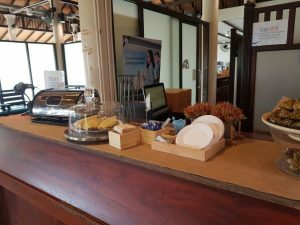 Whats the best time and ferry to leave Koh Chang on to make my flight? We arrive at Trat Airport tomorrow at 5:45pm. Will we make the last ferry at 7pm? And which peir should we go from? You won’t have any problems getting here if you take the airport minibus, that will drop you off at your hotel on Koh Chang. Arrived at Trat 1745 on flight from BKK and left a plastic bag with a jacket and packets of tobacco. Please let me know if you have found it. Great website, very helpful! We’re crossing over from Cambodia and want to catch a flight from Trat, but are realizing it’s about 2 hours to the airport from the border. How would you recommend making the trip? Which border are you crossing from? You can take a minibus form the border to Trat bus station. That is about 150 baht per person. I don’t know the timetable. I think about every hour. Then take a local taxi from trat to Trat Airport. About 45 minutes drive. Or you can arrange a private transfer from the border to the airport through an agent. Question: we Fly PG307 on 22.12. from Bangkok to Trat with arrival time 17:45. Then we want to stay in Trat City Hotel for 1 Night in order to take the ferry to Ko Kood next day. There was a note in the Text above that there is a new mini bus Service from November on from the Airport to Trat City. Is it going, can we rely on it and do you have a link or should we better organise transfer with Krungthep Limousine ? We are travelling with our 2 children (8+10) and dont want to get stuck.